Paige was born in Iowa, moved to St. Louis, then settled in Cincinnati with her family in 1991. She is a proud alumna of Mount Notre Dame High School and went on to graduate from the College of Charleston with a degree in International Business. Growing up, Paige found a passion for horses and continues to love competing in both the Hunter/Jumper divisions. She and her husband enjoy traveling out West to hike, going to concerts, attending sporting events, and thier four furry rescues. Actively serving the community is very important and they volunteer for various organizations including St. Joseph Orphanage and Adore-A-Bull dog rescue. Client service is a commitment that Paige takes seriously, and she works hard to provide the best for her clients. She has several years of experience working with clients from every background and believes in serving them equally. By being part of the Preferred Ohio Team, Paige has access to cutting edge resources allowing her to provide information and comfort during one of the most important life decisions her clients will make. 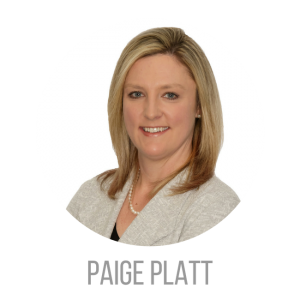 Paige is proud to call the Cincinnati area home and looks forward to helping clients feel the same way!